Following the new east end stand opened in 2008, now Austria Wien is preparing to expand two more sections of the stadium. First, before the end of 2014, a new disabled section will be opened. 2013 was a great year for Austria Wien. The team didn't only win domestic championship, but also qualified for Champions League group stage. They did end last in the group, but the adventure delivered significant boost to club finances. Some €15 million were injected into the club, not including additional sponsorship opportunities. Thanks to this additional income Austria may now go forward with their stadium upgrades. 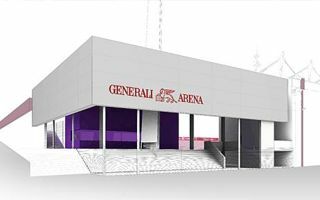 Already in April construction should begin in south-west corner of Generali Arena. The corner will be enclosed with a new disabled section, catering and sanitary infrastructure. New giant screen is also planned. Altogether the works should cost €2.5 million and be done in Autumn of 2014. Then, by the end of the year, Austria plan to submit planning application for the expansion of west and north stands. Both should grow to the height of east stand, only double-tiered section at the moment. Work in the west may begin in the summer of 2015. Austria assure the spending will be rational, depending on financial condition of the club in the future. Delivering all planned works will be very important in the long run, because the last phase, north stand, will include extensive corporate facilities.